I recently announced that I’m going to be running the 2016 TCS New York City Marathon (Sunday November 6th) to help raise awareness (and funds) for some great Down syndrome research. You can learn more about it here, but I thought it would be fun (and maybe helpful for some) if I chronicled my journey to the NYC marathon, outlining my experience and training plan. I’m not sure if I’ll be able to post a blog every week, but I’m going to try! Also I wasn’t sure I wanted to blog about my marathon training on this website since the goal of this blog is to tell Noah’s story. However, since I’m hoping to raise awareness and funds for Down syndrome research (which will ultimately affect his story) I decided to go ahead and go for it. Not to mention, I hope to run a race with Noah at some point! So here we go with week number 1. The marathon training program I signed up for doesn’t start until May 14th, so I am calling the next few weeks a “pre training” program. I’m actually thinking about running a 5K towards the end of May that a friend was telling me about so I set up an advanced 5k training program in the Nike Running App and am going to be using that between now and May 14th. I like the structure of a running program, I feel like it helps keep me on track. Almost all of my shoes are Nike. I like they look and feel. However I decided to go into a local running store to have them take a look at the way I run and perhaps make a suggestion on some running shoes that were specific to my running style. I was informed I pronate as well as have high arches so they suggested some running shoes with more stability. 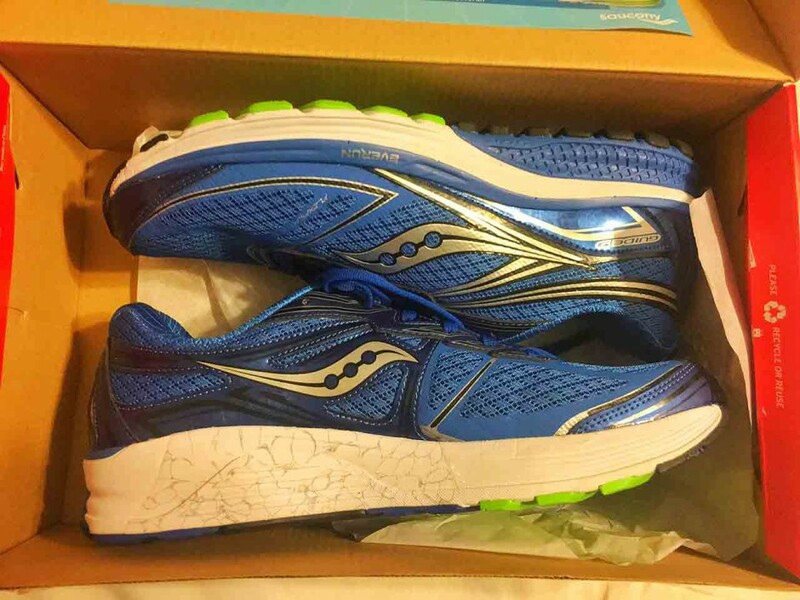 After trying on a few pairs I went with the Saucony Guide 9s. 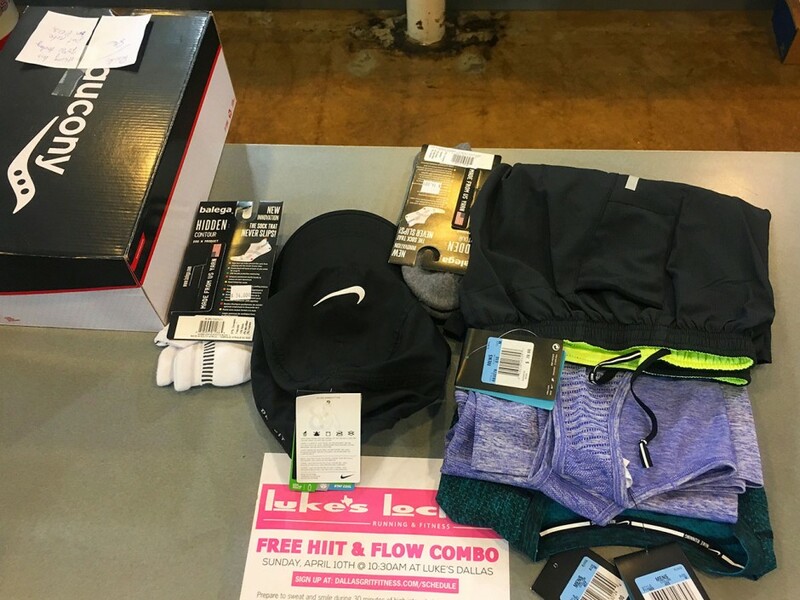 Since I signed up for the marathon training program, the store where I signed up at gave me 20% a one time purchase so I decided to not only buy shoes but a new pair of running shorts (I only have one good pair of running short now and figured I’d need a 2nd when those hot Texas days approach), a hat, some socks and a few running shirts, one of which was a tank top singlet. (To be honest, I was telling my sister in law (who is a seasoned runner) that I couldn’t remember the last time I bought a tank top and she gave me a protein that when a “tank top” is used for running it’s called a singlet. I’ll admit I don’t think I’ve ever heard of a “singlet” before! But now I know…) All of that to say, I bought a singlet today! 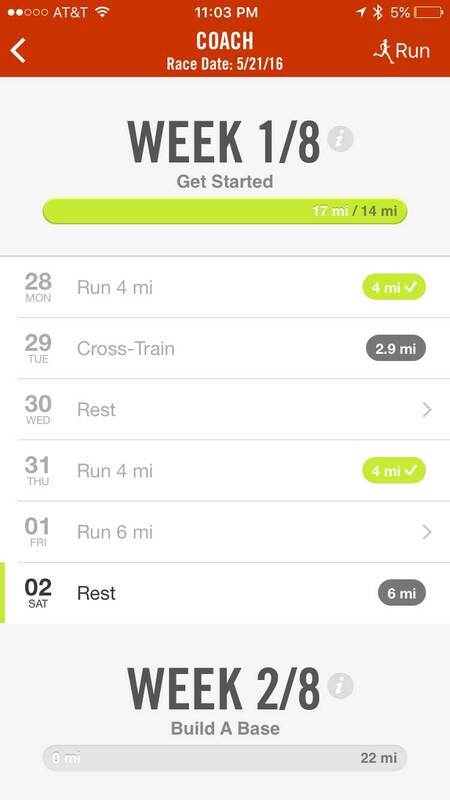 As I mentioned I am using a plan in the Nike Training App until my official marathon training program begins. Throughout my training I want to share all of the details. My mileage, my times, etc. I’m not trying to beat a record, I’m just trying to make it to the finish line, so you’ll see that as I share my stats. Also by sharing my stats and story from now until the race in November we can monitor my progress together between now and the race. It will be fun to come back to this blog post in November and see how my times have (hopefully) gotten better. Here was my plan for the week! Tuesday I did a class at OrangeTheory (which I really like) a got in 2.92 miles on the treadmill at 10’12” per mile. 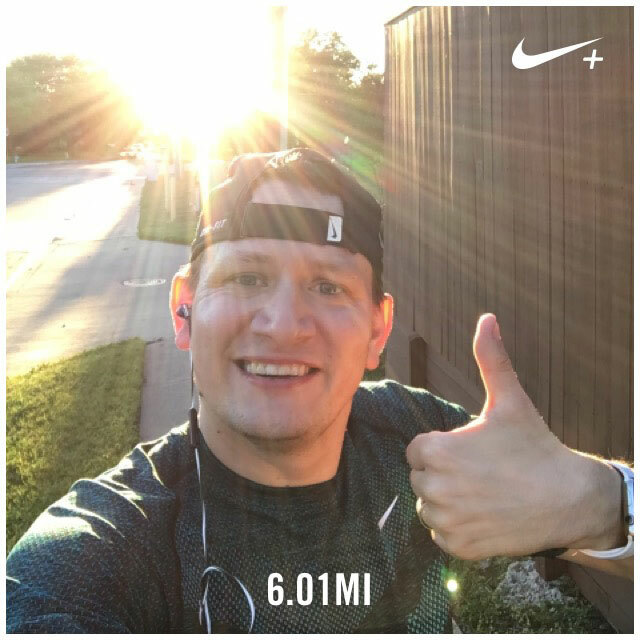 Saturday (long run) – 6.01 miles. 11’02’ per mile. For those of you not familiar with long running, each week (for the most part) I’ll be adding a mile or so on to my long run with the hopes of getting close to 26 miles sometime near November. Ok, that’s my update for my first week of pre training. If you’d like to donate to the cause I’m running for (and help fund some awesome Down syndrome research) you can do so here. Thanks for all of your support and encouragement. Because cancer is the monster in my family as well as claiming many friends, I have been doing the local relay for life and this will be my third year. So far I have lasted 9 hours, and then 12, so this year I am determined to make it to 15 (or beyond). Reading your blog will certainly keep me motivated to do my best and to keep going when I become all whiny and filled with doubt. Thanks for the kind words and way to go for your running! Keep us updated. Good luck on your preparation for the big one. I think that is wonderful. Good going. Keep up the good work. Pleased to see the training is going well. It was lovely to see the news item so happy for you all.